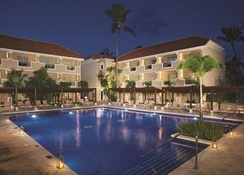 Overlooking the azure Caribbean Sea and palm-studded, golden yellow beaches of Punta Cana, Dreams Palm Beach Punta Cana resort and spa presents the idyllic haven for couples seeking to rekindle their romance or families trying to have a good time. 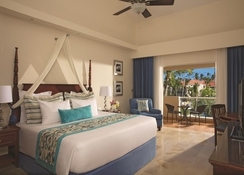 This 4-star plush hotel not only boasts stunning views of the Caribbean landscape but also provides its guests with luxury accommodation and world-class services. Spend a weekend or a long-haul holiday spanning the whole summer – this resort is sure to blow you away. Its more than 500 well-furnished rooms, gourmet dining options with top-shelf spirits, a 300-metres long white sandy beach, outdoor pool, kids’ clubs, exhilarating water sports and its world-class spa are just some of the features that make this holiday retreat a special one for those who appreciate comfort and refinement. Business travellers, too, have a wealth of features such as a large convention centre for hosting their business meets and social events. The hotel also offers fantastic all-inclusive packages that come with a range of amenities including unlimited access to food and drinks, daily refreshed mini-bar, daytime activities and live nightly entertainment, access to theme parties, oceanfront bars and entertainment venues, free Wi-Fi and international calling to selected countries. 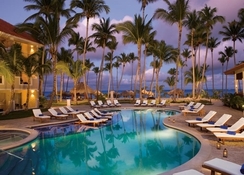 The hotel is located in Punta Cana, one of the most picturesque beaches of Dominican Republic. The nearest shopping and nightlife destination from the resort is within a 15 minute-drive and the nearest airport, D.R. Punta Cana Airport is approximately 25 minutes away by car. The resort is also surrounded by five golf courses, Punta Espada Golf Club, The Faldo Legacy Course (Roco Ki), Los Corales Golf Club, La Cana Golf & Beach Club and Cocotal Golf & Country Club. 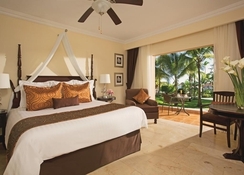 Dreams Palm Beach Punta Cana offers 500 luxurious non-smoking rooms, which are divided into eight categories. 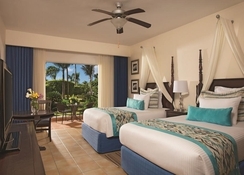 The existing categories are: Deluxe Tropical View, Preferred Club Deluxe Tropical View, Preferred Club Deluxe with Jacuzzi Tropical View, Preferred Club Deluxe Ocean View, Preferred Club Deluxe with Jacuzzi Ocean View, Preferred Club Honeymoon Suite with Jacuzzi Tropical View, Preferred Club Honeymoon Suite with Jacuzzi Ocean View and Presidential Suite Ocean-Front View. Each room is well-appointed and features an array of amenities, including king- or queen-sized beds, balcony or terrace, TV sets with satellite connection, en-suite bathrooms, luxury bath amenities air conditioning, room service, tea/coffee maker, work desk and so on. With an additional charge, you can also avail of butler services. You’ll receive a cell phone, on which you can call the butler between 8:30am and 11pm. The hotel has eight restaurants, each specialized in different cuisines. Bordeaux is an adults-only restaurant that serves French cuisine, El Patio serves an assortment of authentic Mexican cuisine, Himitsu is for Asian cuisine. Portofino specializes in Italian fare. Seaside Grill offers snacks and grilled items and World Café serves international buffet. Barefoot Grill is another restaurant that served grilled items. Finally, Coco Café serves premium coffee and deli snacks. There are five lounges and bars spread across the property. Desires is an old-time favourite of music lovers. Manatees is the poolside bar. Rendezvous is the cocktail bar mostly used after dinner, while Showtime is the theatre bar. 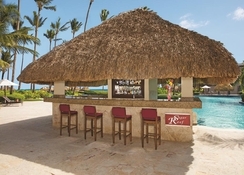 Finally, Sugar Reef is the bar located on the beach. These bars and lounges serve a wide collection of branded spirits, sizzling cocktails, mocktails and health drinks. 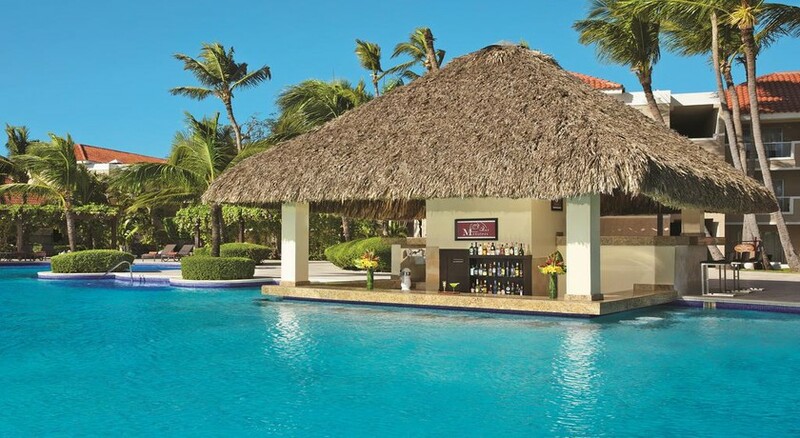 Speaking of recreational activities and facilities, there is a lot to enjoy while staying in Dreams Palm Beach Punta Cana. You can laze in the hammock or by the pool and soak up the summer sun on the private white-sand beach. But if you are feeling a bit sporty, tee off at one of the 5 golf courses nearby, or choose from an extensive list of sports on site. The game arcade offers table tennis, darts, board games and more. There is also a casino equipped with blackjack tables, slot machines, poker tables and roulette tables. Other activities include bocce ball, volleyball, beach ball, beach football, stretch classes, aerobics and dance classes. Water sports available are kayaking, water aerobics, windsurfing, snorkelling, scuba diving and so on. The on-site luxury spa offers a host of massages and body treatments for all age groups, plus a fitness centre for health enthusiasts. There are two kinds of clubs for young guests: Explorer’s Club (for kids between the ages of 3 to 12 years) and Core Zone Teens Club (guests from 13 to 17), both of which offer a variety of games and sports. Activities on the chart are Xbox play station, billiards, batting cage, table games, table football and many more. For adults, there are also theme nights and poolside parties.